#1. This week's number one is former international small forward Thanasis Antetokounmpo (199-92, currently plays in Euroleague). He led his Greek team Panathinaikos to a victory against the closely-ranked Olympiacos (3-3) 93-80 in the Euroleague on Friday night. Antetokounmpo scored 12 points in only a mere 14 minutes on the court. Panathinaikos Superfoods Athens (4-2) is placed sixth in the Euroleague. This year Antetokounmpo averages: 6.8ppg, 1.5rpg, 1.3spg, 2FGP: 88.2%(15-17) and FT: 62.5% in six games he played so far. He has a dual citizenship: Nigerian and Greek. Antetokounmpo played for the Nigerian senior national team two years ago. #2. Second place goes to an international forward Al-Farouq Aminu (206-90, college: Wake Forest, currently plays in NBA). He contributed to a Portland Trail Blazers' victory against the New Orleans Pelicans (5-6) 132-119 in the NBA in Thursday night's game. Aminu recorded a double-double by scoring 17 points and getting 10 rebounds. The Portland Trail Blazers have a solid 9-3 record this season. It was his team's third consecutive victory in a row. But the season is still in it's first stage and everything can happen. It's Aminu's fourth year with the team. He has relatively good stats this season: 8.3ppg, 8.7rpg, 2FGP: 47.6%, 3FGP: 34.2% and FT: 90.9%(20-22). Aminu is another player who holds two passports: Nigerian and American. Despite he played previously for the USA U19 national team, Aminu is currently a member of the Nigerian senior national team. #3. The Nigerian player who performed third best last week abroad was an experienced former international forward Abdullahi Kuso (206-84, college: Tallahassee CC, currently plays in Japan). He could not help Gunma (6-7) in their last game. Despite Kuso's very good performance the third-placed Gunma (6-7) lost 85-93 at home to the leading Dragonflies in the East group. He had a double-double by scoring 20 points and getting 13 rebounds. Kuso also added 4 assists and 3 blocks in 38 minutes. It's Kuso's first season with the team. This year he has relatively solid stats: 14.3ppg, 11.2rpg, 2.5apg, 2.2bpg, 1.4spg, 2FGP: 47.3% and FT: 69.7% in 13 games. Kuso played for the Nigerian national team eleven years ago. #4. Guard Ike Iroegbu (188-95, college: Washington St., currently plays in Germany) was not able to help Science City Jena (2-3) in their last game on Saturday. Despite his very good performance Science City Jena was defeated 98-87 on the road by the higher-ranked Eisbaeren Bremerhaven (#7). Iroegbu was the top scorer with 26 points. But there are still lots of games to play and it's a long way to go. Iroegbu has reliable stats this season: 13.8ppg, 2.8rpg and 2.0apg. He is also Nigerian national team player. #5. International guard Michael Efevberha (193-84, agency: Octagon Europe, college: CS Northridge, currently plays in Lebanon) was the major contributor in Homentmen's victory against the closely-ranked Atlas Ferzol (1-1) 90-84 in the Lebanese LBL in Saturday night's game. Efevberha scored 18 points and grabbed 6 rebounds in 24 minutes. It was his first game for Homentmen this season. His team is placed second in the LBL. His team will play only one more game in the Regular Season. And that game will be critical. Efevberha has both American and Nigerian nationalities. He plays currently for the Nigerian national team. #6. Power forward Gani Lawal (206-88, also represented by Octagon Europe, college: Georgia Tech, currently plays in Japan) led Shiga L-Stars to a 3-point victory over the leader Tochigi Brex (11-2) 93-90 in the Japanese B League in Saturday night's game. Lawal was MVP of the game. He scored 31 points (!!!) and grabbed 9 rebounds in 39 minutes. Shiga Lakestars (3-10) are placed fifth in West group. Lawal has individually a very good year with high stats. He averages: 20.1ppg, 12.0rpg, 1.9apg and 1.5bpg in 13 games. Lawal also holds two passports: Nigerian and American. He is a former international player as he played for the Nigerian senior team five years ago. #7. International swingman Stan Okoye (198-91, college: VMI, currently plays in Spain) helped Zaragoza edge the closely-ranked CB Canarias (4-3) 88-86 in the Spanish Liga Endesa last Saturday. Okoye recorded 14 points and added 3 assists. Tecnyconta Zaragoza (3-4) is placed ninth in the Liga Endesa. They ended the series of three consecutive loses. Okoye's stats this season are: 11.2ppg and 3.0rpg. He holds both American and Nigerian passports. Okoye is also Nigerian national team player. #8. Guard Obi Emegano (190-93, college: ORU, currently plays in France) was not able to secure a victory for JDA Dijon (7-1) in their game against ASVEL Lyon-Villeurbanne Basket (2-4) in the French ProA. Emegano scored 9 points. But JDA Dijon was defeated 39-26 in Villeurbanne by the much lower-ranked ASVEL Lyon- Basket (#10). Emegano's overall stats this season are: 9.8ppg, 2.3rpg and 1.3spg. He plays currently for the Nigerian national team. #9. International power forward Alade Aminu (207-87, college: Georgia Tech, currently plays in Israel) couldn't help Hapoel Tel-Aviv (1-5) in their last game on Thursday. Despite Aminu's very good performance the bottom-ranked Hapoel Tel-Aviv was edged 77-76 in Hod Hasharon by the higher-ranked Bnei Hasharon (#10). He was the second best scorer with 15 points. Aminu also added 8 rebounds. Aminu averaged so far 11.8ppg, 6.0rpg and 1.2bpg. He is also in the roster of the Nigerian national team. #10. Center Ekenechukwu Ibekwe (207-85, college: Maryland, currently plays in France) couldn't help Levallois (5-3) in their game against JSF Nanterre (4-3) in the French ProA. Ibekwe scored 8 points in 17 minutes. Levallois was edged 47-44 on their home court in Levallois by the lower-ranked (#8) JSF Nanterre. This year Ibekwe's overall stats are: 6.6ppg and 3.8rpg in five games. He holds both American and Nigerian passports. Ibekwe is a former international player as two years ago he still played for the Nigerian senior national team. #11. International forward Emmanuel Omogbo (203-95, college: Colorado St., currently plays in Lithuania) couldn't help one of league's weakest teams P.Zvaigzdes in their game against Prienu Skycop in the Lithuanian LKL. He scored 9 points and grabbed 5 rebounds in 26 minutes. His team lost 88-93. Omogbo has very impressive stats this year: 15.6ppg, 5.9rpg and 2.1spg in nine games. He holds both American and Nigerian passports. Omogbo plays currently for the Nigerian national team. #12. Former U22 international power forward Dinma Odiakosa (203-85, college: Illinois St., currently plays in France) helped Sluc Nancy win their game against the league outsider Paris 93-87 in the French ProB (second division) in Sunday night's game. He recorded 12 points and grabbed 7 rebounds in 28 minutes. This year Odiakosa's total stats are: 9.5ppg, 8.0rpg and 1.8apg in four games. He used to play for the Nigerian U22 national team back in 2004. #13. International power forward Talib Zanna (206-90, college: Pittsburgh, currently plays in Spain) managed to help Montakit Fuenlabrada to win against the second-ranked FC Barcelona 79-73 in the Spanish Liga Endesa last Saturday. Zanna recorded only 4 points and grabbed 4 rebounds. Zanna has averaged so far 5.6ppg and 3.1rpg. He is also Nigerian national team player. #14. Former international power forward Suleiman Braimoh (203-89, college: Rice, currently plays in Israel) helped Hapoel Eilat win their game against the closely-ranked Maccabi Rishon 75-72 in the Israeli Winner League in Monday night's game. Braimoh scored 8 points, grabbed 6 rebounds, passed 3 assists and added 2 blocks. 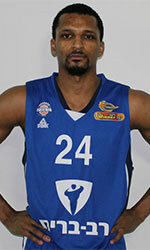 It was his first game for Hapoel Eilat this season. Braimoh holds both American and Nigerian passports. He used to play for the Nigerian national team back in 2016. #15. International center Augustine Okosun (209-86, college: Keiser, currently plays in Bulgaria) helped Yambol win their game against the league outsider Cherno More 90-79 in the Bulgarian NBL in Saturday night's game. Okosun scored 13 points, grabbed 6 rebounds and made 2 blocks in 23 minutes. Okosun's stats this year are: 14.3ppg and 6.8rpg in four games. He holds both American and Nigerian passports. Okosun is also in the roster of the Nigerian national team. #1. Victor Oladipo (193-G-92, college: Indiana, currently plays in NBA) could not help the Indiana Pacers (7-5) in their last game. Despite his very good performance the Indiana Pacers (7-5) lost 94-100 on the road to the Philadelphia 76ers. Oladipo was the top scorer with 36 points. He also added 6 rebounds, passed 7 assists and added 3 blocks in 37 minutes. But this is still an early stage of the season and everything may happen. Oladipo has individually a very good year with high stats. He averages: 24.1ppg, 7.1rpg, 4.3apg and 1.6spg in 12 games he played so far. Oladipo has a dual citizenship: Nigerian and American. #2. Giannis Antetokounmpo (211-G/F-94, agency: Octagon Europe, currently plays in NBA) was not able to help the Milwaukee Bucks (9-2) in their last game on Thursday. Despite his very good performance the Milwaukee Bucks (9-2) were defeated 117-113 in Boston by the Celtics. Antetokounmpo recorded a double-double by scoring 33 points and getting 11 rebounds. He also added and 3 steals. But the season just started, so everything may happen. It's Antetokounmpo's sixth year with the team. This season Antetokounmpo has very high stats. He averages: 25.6ppg, 12.9rpg, 5.7apg and 1.3bpg. Antetokounmpo is another player who holds two passports: Greek and Nigerian. #3. Micheal Eric (210-C-88, college: Temple, currently plays in Turkey) was not able to secure a victory for Darussafaka (6-0) in their last game on Sunday. Despite Eric's very good performance the league leader Darussafaka was defeated 82-78 at home by the lower-ranked Tofas (#4). He was the top scorer with 19 points. Eric also added 6 rebounds. Eric's stats this season are: 10.3ppg and 5.3rpg. #4. Peter Olisemeka (204-C-91, currently plays in Bulgaria) was the major contributor in an Academik Plovdiv's victory against the closely-ranked Academic Sofia (2-3) crushing them 102-79 in the Bulgarian NBL on Saturday night. He had a double-double by scoring 23 points and getting 19 rebounds. Olisemeka also added 3 assists and 2 blocks in 30 minutes. Akademik Bultex 99 Plovdiv (1-3) is placed seventh in the NBL. It was his team's first victory after three consecutive loses. Olisemeka's stats this year are: 11.8ppg, 14.3rpg, 1.8apg and 1.8spg in four games. He has both Nigerian and Italian nationalities. #5. Josh Okogie (193-G-98, college: Georgia Tech, currently plays in NBA) couldn't help the Minnesota Timberwolves (4-8) in their last game on Friday. Despite Okogie's very good performance the Minnesota Timberwolves (4-8) were badly defeated 116-99 in Oakland by the Golden State Warriors. He scored 15 points and grabbed 5 rebounds. Okogie's stats this season are: 8.7ppg, 4.3rpg, 1.2apg and 1.1spg. He also holds two passports: Nigerian and American. Despite Okogie's Nigerian nationality, he currently plays for the USA U19 national team and is not eligible to play for the Nigerian team. #6. Michael Ojo (216-C-93, college: Florida St., currently plays in ABA League) managed to help Crvena Zvezda MTS Beograd in a victory against the ninth-ranked Cedevita 94-79 in the ABA League last Saturday. He scored only 3 points, had 8 rebounds and made 2 blocks in 17 minutes. This year Ojo's overall stats are: 6.7ppg and 6.0rpg in six games. Worth to mention Ojo played also at Eurobasket Summer League, which helped him get the job in pro basketball. #7. Abdul-Malik Abu (203-F-95, college: NC State, currently plays in Croatia) couldn't help one of league's weakest teams KK Vrijednosnice Osijek (3-2) in their last game on Sunday. Despite his very good performance KK Vrijednosnice Osijek was crushed 90-69 on the opponent's court by the higher-ranked KK_Zadar (#4). Abu was the second best scorer with 15 points. He also added 6 rebounds. This season Abu has very high stats. He averages: 15.6ppg, 8.4rpg and 1.8apg. #8. Semi Ojeleye (201-F-94, college: SMU, currently plays in NBA) faced previously mentioned Giannis Antetokounmpo in the NBA last game. Ojeleye contributed to a Boston Celtics' victory against the Milwaukee Bucks 117-113. He scored 10 points and grabbed 5 rebounds in 22 minutes. This year Ojeleye's overall stats are: 2.0ppg and 1.1rpg in eight games. He holds both American and Nigerian passports. #9. Christian Nwogbo (190-F-91, also represented by Octagon Europe, college: Cedarville, currently plays in France) led SPO Rouen to a victory against the closely-ranked ADA Blois 86-78 in the French ProB (second division) in Saturday night's game. Nwogbo recorded 18 points and grabbed 7 rebounds. Nwogbo averaged so far 10.3ppg and 4.8rpg. He holds both American and Nigerian passports. #10. Ike Joseph Udanoh (203-PF-89, another player represented by Octagon Europe, college: Wayne St., MI, currently plays in Italy) couldn't help MIA-RO Cantu in their game against Happy Casa BR in the Italian Serie A. Udanoh scored 5 points and grabbed 8 rebounds in 32 minutes. His team was badly defeated by 17 points 76-59. Udanoh's stats this year are: 11.4ppg, 9.0rpg, 4.4apg and 1.6spg in five games. He holds both American and Nigerian passports.